Just a quick shot of where I’m at with the Sandcastles quilt. 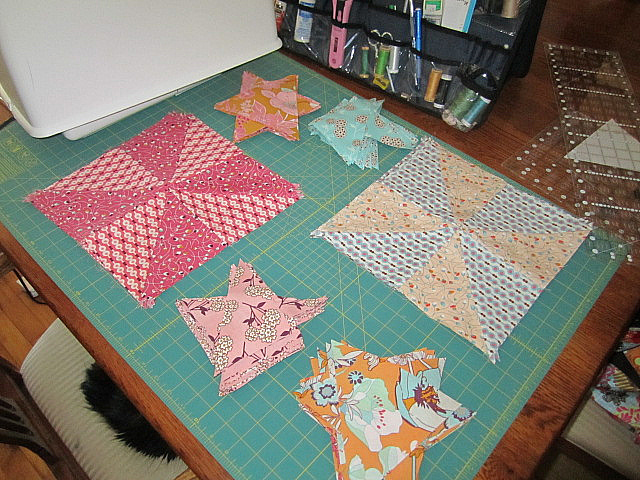 I cranked out a number of large (12.5″) pinwheel blocks when I was up north, in different colorways. There are also some 300+ triangles cut out to date, though I have since completed more since taking this picture. These were all cut using templates as guides, which I find more cumbersome than just working with straight measurements. I’m whiny anyway, cuz cutting fabrics is my least favorite part of the quilting process, but the end is in sight; piecing should come together quickly. I must have been doing an okay job, as my quilting inspector curled up for a nap half under the table while I was working. Also wanted to share these funky yarned hangers my mother-in-law passed along to me. My husband vaguely remembers her working on them, possibly some 30 years ago. 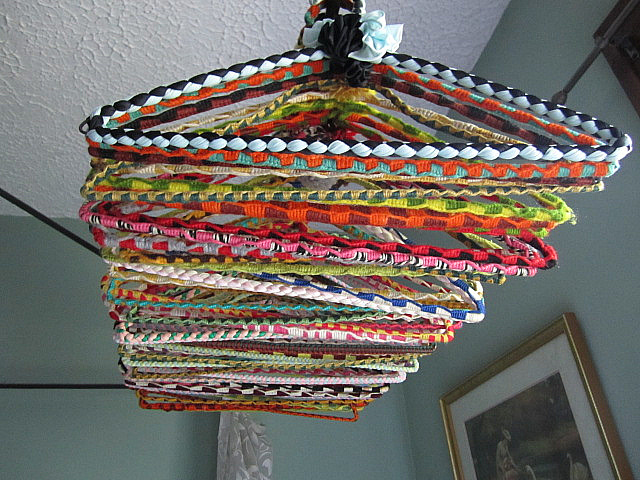 What I love is that before recycling and repurposing were in vogue, those with common sense and a strong artistic bent like my mother-in-law gave nasty wire hangers a whole new life. I, guiltily, throw these out. I hate wire hangers, and not just because I saw “Mommy Dearest” when I was kid. 😉 Somehow the collection altogether like this in bunches of vibrant colors make me so happy, and I LOVE how well they grip some of my more slippery blouses and such. Actually, not all are yarn; a few were braided beautifully with contrasting satin ribbons. With my mother-in-law’s typical flair, she adorned almost every hanger with a pom-pom or fabric rosette, depending on the medium used to cover the hanger. My closet has become much more cheerful-looking! April, thank you for sharing a bit of the future (quilt) and a bit of the past (hangers). 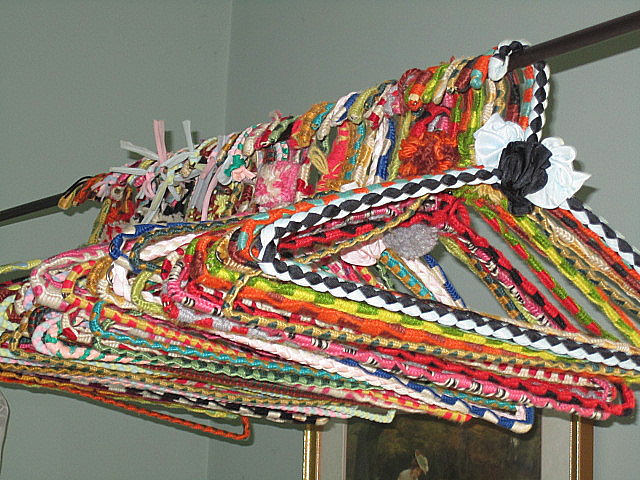 I remember my grandma used to make the same kind of hangers…. but I hadn’t thought about them in years, if at all….thank you for shaken up the cob webs in my mind~! Always fun to read your blog~! Nancy, thanks for reading! I’m so glad you enjoy. Hopefully the quilt will be more fully realized in the next couple of weeks LOL! Those hangers are absolutely amazing! What a happy sight they must be in your closet!